Juggling . . . again! I sit here tonight knowing full well that my day tomorrow is going to be crazy. Why, you might ask? Simply put, I have to juggle the home/school/work life all over again. 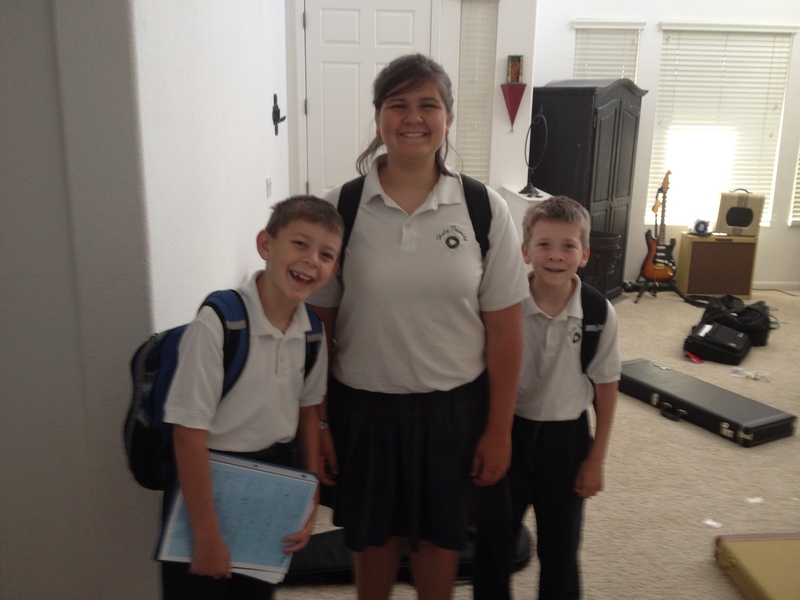 Every year, since we’ve moved to California, I have been at the school and walked my kids into the first day of school. I question, every year (even my wife used to get mad at my persnickety nature during these days) the wisdom of having the kids come to school, sit with their parents in the church for an assembly and then have them go to their classrooms at 8:45 or 9 only to be dismissed at noon. Three hours of classroom work. Now, I understand. Teachers want to ease them into school. The school is celebrating the first day, whatever you want to say about it. I’m it, though. I take care of the kids and get them there and have to pick them up. Abbi, my oldest, started school a couple weeks ago so she can’t pick them up at noon. She also got a job this year after school and she’s trying out for the school’s big play this year. She’s got a crazy schedule, too. On top of that, her tendency to procrastinate (which she unfortunately got from both parents) is getting the better of her. Add to that her ability to act just like her mother when things are stressed out and she’s scowling a lot. This comes with the added fun of having to meet about Noah’s behavior problems from last year again. He’s done nothing, it’s the first day of school. Now, understand, I had a change in insurance. I had them all in Nebraska over the summer. It’s not a choice I made lightly. I have to work to pay the bills. I don’t have a full-time babysitter because, frankly, I can’t afford that and so my parents are a blessing every single summer. Add to that the fact I have to find a therapist for Noah that is going to actually work with him, not medicate him. He’s not bipolar. He’s not violent. He’s got problems controlling his impulses and he always wants to be the center of attention. I get that he’s acting out when he doesn’t get his way, but I don’t think others get him like I do. I don’t enable the behavior nor do I stand up for him when he acts out. However . . . I do feel sometimes that the only advocate the poor kid gets is me. There were at least a couple occasions toward the end of the year that his brother, Sam, told me that Noah got in trouble and wasn’t part of whatever debacle was occurring in the school. Noah should have one person in his corner and that person should be me. There’s a big push to make it seem like these kids are having troubles and issues just because their Mom died. I get that, it’s an easy path and a simple explanation. I, however, know that it’s not the right one. Sure, I would be there’s a bit of it contributing, but Noah has his issues. That’s why I get him help. I don’t want to have the poor guy saddled with a bad reputation without knowing I did everything I could to help him. It’s too easy to say the world we live in is a mess because of Andrea’s passing. Yes, it’s true, I miss her, the kids miss her, and our world is still a bit empty and horribly bleak at times because I miss that presence. But each day is a little different; each day is a bit less frayed around the edges. We weave the story a little more each day. My kids know that sometimes we don’t have all the school supplies on the first day because we have to wait until Wednesday, when the next check comes in. They’re OK with that. My pre-planning comes into play here. I put the fixings for a stew into the crock pot. May not be Martha Stewart’s preferred method, but I used my own recipe and the kids will like it. Screw anyone who thinks less of it for cooking all day. But we’re together, and unlike years past, when I’d tell Andrea she needed to deal with this, I see the things they need and the things they want. I’ve been to every first day of school. Sometimes, to be their advocate, you have to know what they need and not just what they want. I have to make it back up to pick them up from school at noon, get them home and cared for, meet with the school, then go back to work. Even when you see the look of disappointment on their faces. Wow, seems like the scales have tipped completely to the other direction. After my sister was murdered, the teachers in my school (also a Catholic school) wanted me to be back to normal in just a couple of months. I mean, I’m glad I didn’t have to “talk about it” with some bozo who didn’t really know anything about grief, but you don’t just get over something like that, that quickly. Now it seems educators have over-corrected to the point that they think your kids can’t cope a year and a half after the fact. A little balance would be nice.